The Ultimate Super Bowl Snack Playoffs Start Now. VOTE! The Super Bowl is a grand time for food. All those New Year's Resolutions about eating right, getting fit, and drinking less go out the window just in time for nimble fingers to set to work crafting the perfect snack stadium or dialing Dominos. And so, as is our tradition, we have made a foodstuffs-themed bracket. This year, we shall set out to determine The Ultimate Super Bowl Snack. Cases can be made for divisional realignment. Go ahead and make them! It won't change anything. Stating this will not stop you from hurling all manner of invective my way, but I shall do so nonetheless: These seedings are not based on my personal preference. If that were the case, this entire bracket would be comprised of Corn Nuts and Ruffles and I'd close the voting because what kind of monster would ask someone to choose between the two? There are 32 entrants because there are 32 NFL teams. 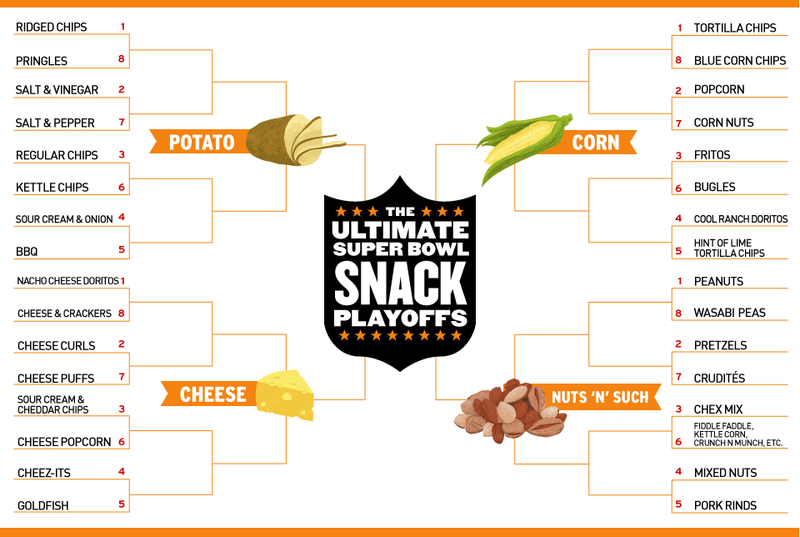 And also because we'd be here forever if we did a 64-snack Snack Bracket. HOWEVER. You will assuredly make great hay out of any and all omissions because screaming on the internet is so deeply satisfying. Scream away. We'll pop the popcorn. Speaking of things you'll scream about! The Potato Division is comprised of both chip styles (ridged, kettle) and flavors (sour cream & onion, salt & vinegar). You will hate this. Sadly for you, you're not in charge of the Snack Bracket. As a concession, for the first round the seedings were chosen such that style is pitted against style, and flavor against flavor. In summation, Ruffles 4 Lyfe. Some definitions may be needed, based on an informal semantic polling of the Deadspin staff. 1. Cheese curls v. cheese puffs: Cheese curls refer to Cheetos and suchlike, while cheese puffs refer to Cheez Doodles or cheese balls. 2. Regular Chips means, in the words of our very own Kyle Wagner, "Lays, basically." Classic is another term for them. Privately, I've been calling this thing the Snacket. It'll be our little secret. Here are the full seedings, with the bracket by Jim Cooke above. Fiddle Faddle, Kettle Corn, Crunch N Munch, etc. With that, let the voting begin! You have until Noon EST tomorrow (Wednesday, January 21) to cast your ballot before we move onto the next round.